Home renovating or home remodeling can mean a lot of different things to a lot of different people. Renovating homes can mean gutting the entire inside of a home and effectively doing a complete home renovation, or it could mean building a home addition onto an existing home. No matter the size of a home renovation project, to be successful, upfront design and planning is essential. The first step in a home renovation project is to put your ideas to paper. Right down the list of features you want to see in your finished renovated home project. Also make a couple of sketches of the floorplan and the exterior view you envision in your home renovation. Make sure to include dimensional information in your sketches. This will aid in the contractor bidding process and help to more accurately estimate home renovation costs. After getting your renovated home ideas on paper you can then either transfer them onto a computer with the help of a home design software package or you can visit an architect. Regardless of which path you choose it is essential in any home renovation project to generate a formal set of home construction plans. The home construction plans, or blueprints, provide all the essential information necessary for obtaining home remodeling permits and for soliciting home renovator bids. The finished renovated home plans will include a floorplan, all necessary dimensional information, cross-sectional construction views and various elevation views. A set of architecture generated home renovation plans will typically cost around 5 to 10% of the total home renovation costs. Once a complete set of home remodeling plans are in place you can then begin soliciting home renovation contractor bids. Make sure to obtain home renovator contractor bids from at least three contractors so that you have a sufficient number of proposals to compare against one another. Also, make sure when reviewing the bids that they include thorough cost breakdown lists for all of the materials to be used in the home renovation. Discard any bid that does not have a thorough cost breakdown list in it. In general, when selecting a renovation contractor bid it is usually the mid priced bid that is the safer bet, all other factors equal. Going with the lowest bid frequently ends up in disappointment down the road. After selecting a contractor for remodeling your home, you can then move on to the financing phase of the home renovation project. When it comes to financing and renovating homes, many homeowners seek home equity loans or refinance their entire home for a larger loan amount to pay for the cost of the home construction. 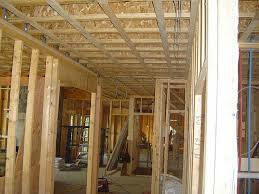 Again, having a complete set of home renovation plans is essential in applying for new home remodeling financing. With home remodeling plans in hand, a home renovator contractor lined up, and financing secured, all that is left to do is pull the home construction permits. Once the permits have been obtained the actual home renovation can begin. During the actual home renovating and construction, make sure to check the progress of your home renovation at least a few times a week. In addition, make sure to hold off milestone payments to the home renovating contractor until the work has been completed to your satisfaction. Paying ahead of time is a recipe for disaster. Also, make sure home remodeling inspections are scheduled and signed off before the contractor begins the next phase in the home renovation project. By following this simple home renovation plan, your chances of a successfully renovated home are improved greatly. 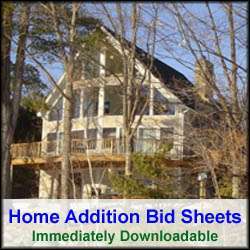 For more help on a home renovation, see HomeAdditionPlus.com’s Home Addition Bid Sheets. Our Home Addition Bid Sheets provide you with the knowledge and information on how to plan a home building project, and what to look for when hiring contractors. They also include detailed cost breakdown tables and spreadsheets for estimating your own new home construction building costs.